lovers from all over the world come to see it. A new stamp from the U.S. Postal Service® celebrates the 150th anniversary of Nebraska statehood. Nebraska was admitted to the union on March 1, 1867. The photograph on this stamp was taken on the banks of the Platte River as sandhill cranes flew low overhead at sunset. At the onset of spring, half a million of these ancient birds return to the river during their annual migration, a spectacle unique to Nebraska. After a day spent feeding in fields nearby, they are seen here scouting for sandbars that provide nighttime roosts safe from riverbank predators. Nebraska photographer Michael Forsberg took the photograph sometime around the year 2000. Nebraska Statehood is being issued as a Forever® stamp. This Forever stamp will always be equal in value to the current First-Class Mail® one-ounce price. 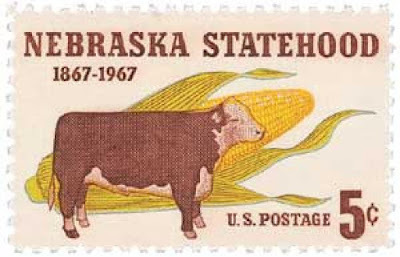 The beautiful new stamp far outstrips the dull one issued to commemorate Nebraska's centennial. Among the criticisms in 1967 was that the cow pictured really did look like something from 1867.